Cave paintings are discovered in Lascaux, France. On this day in 12 September 1940, near Montignac, France, a collection of prehistoric cave paintings are discovered by four teenagers who stumbled upon the ancient artwork after following their dog down a narrow entrance into a cavern. The 15,000 to 17,000-year-old paintings, consisting mostly of animal representations, are among the finest examples of art from the Upper Paleolithic period. First studied by the French archaeologist Henri-Édouard-Prosper Breuil, the Lascaux grotto consists of a main cavern 66 feet wide and 16 feet high. The walls of the cavern are decorated with some 600 painted and drawn animals and symbols and nearly 1,500 engravings. The Battle of Marathon: The Athenians and their Plataean allies, defeat the first Persian invasion force of Greece. The first Persian invasion was a response to Athenian involvement in the Ionian Revolt, when Athens and Eretria had sent a force to support the cities of Ionia in their attempt to overthrow Persian rule. 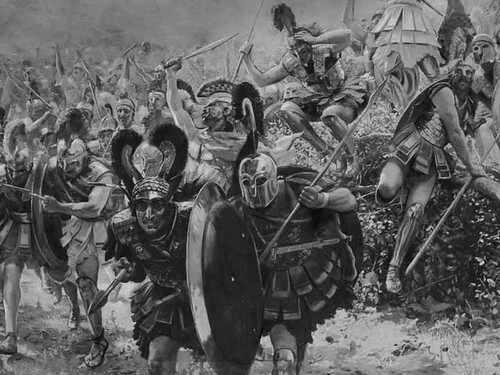 The Athenians and Eretrians had succeeded in capturing and burning Sardis, but they were then forced to retreat with heavy losses. In response to this raid, Darius swore to burn down Athens and Eretria. According to Herodotus, Darius had his bow brought to him and then shot an arrow “upwards towards heaven”, saying as he did so: “Zeus, that it may be granted me to take vengeance upon the Athenians!”. Herodotus further writes that Darius charged one of his servants to say “Master, remember the Athenians” three times before dinner each day. Bonanza, the first regularly scheduled TV program is presented in color. The airline, Ansett Australia collapses due to increased strain on the international industry.10,000 people loose their jobs. A military coup in Turkey. Ansett Australia collapses due to increased financial strain on the airline industry. Over 10 000 people are made unemployed. The Battle of Marathon where the Athenians and Plataean, defeat the Persian invasion force of Greece.